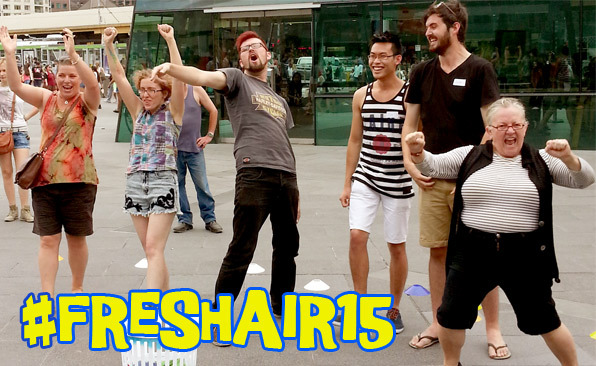 Melbourne’s International Games Festival, Fresh Air, is back for 2015, hosted by Pop Up Playground and commissioned and presented by Federation Square’s Creative Program. Headlining Fresh Air this year are Fire Hazard Games from the UK, who are running the enormously popular street game City Dash and a brand new story telling game Flashpoint Fairytale. Escape Room Melbourne, Australia’s leading escape room designers, premiering a brand new boutique work on site. And for one night only, Folly, a new city wide urban role playing game by the team who bring you Woodfordia, the woodford folk festival game. We’ll also be showcasing new works by local designers Christy Dena, Georgia Symons, Kilkenny Games and Snapstone games, alongside some old favourites and some new games by Pop Up Playground and by our old friends at Coney, Hide and Seek and Slingshot. 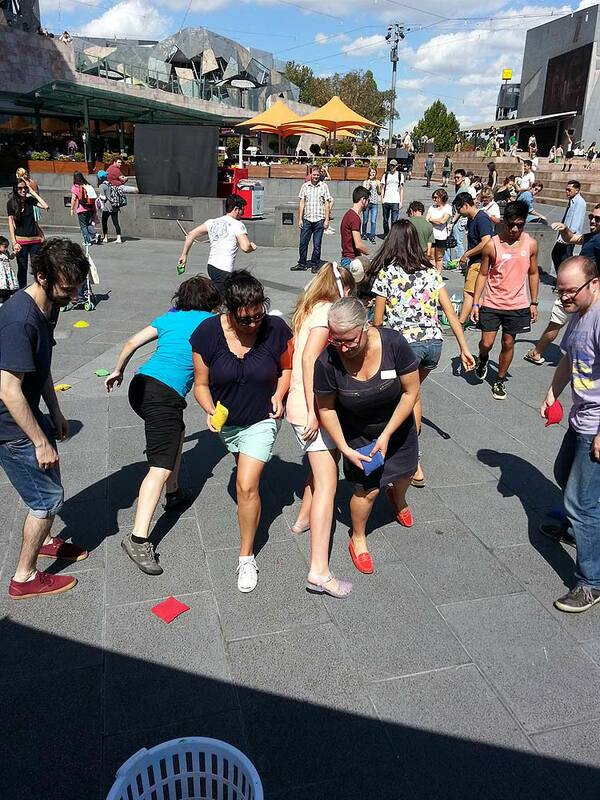 We’ll be playing street games in St Pauls Court and the Amphitheatre at Federation Square from 11 am to 4pm friday to monday. The Night time program starts at 6 – and runs til 9.00. Tickets for head line games are essential and can only be booked online. An exciting and intense hour in the city. Run for checkpoints, replan on the fly as the map changes, and duck for cover as our patrolling guards close in. Or take it more strategically, rack your brains to solve our cryptic clues, and keep your eyes open for bonus points. However you play, you can watch the live scoreboard for updates and battle it out with nearby teams. With a huge range of strategies, approaches, and levels, you can take this as casually or competitively as you want. Folly is an UrbanRPG with an absurdist bent. Expect ridiculous challenges, dares, an interactive and hilarious narrative and a spectacular finale. Developed by Tim Monley, creator of Woodfordia: The Game, a spectacular six day long game played every year by thousands of participants at the Woodford Folk Festival. For Fresh Air Festival this experience has been condensed into three hours of silliness and adventure for one hundred lucky people. Flashpoint Fairytale is a storytelling tabletop game filled with old maps, evil overlords, witches, trolls and, despite being a game played over a table, lots of running around and shouting. Players choose a character (whether inventor, doctor, wizard, hero or diplomat) and then work together to help that character escape the enemy, survive the story and find out what on earth is going on and how they can (oh yes) save the land. Created by Fire Hazard Games. Requires 4 to 5 players. You are a contestant in the finale of the 9th Annual Cake Decorating Championship. One of the hosts has been embroiled in a bitter buttercream scandal, and so you arrive to find an Anarchist is now running the competition. In this hands-on live game, you do whatever you can to impress the revolutionary philosopher with your anarchic cake decorating to ultimately win the championship, or the good fight. Tickets are $20 each, or $70 for a full team of four. A new puzzle room experience from the team at Escape Room Melbourne! Melbourne in the 1950s. Government spies have caught word of a planned assassination, and you’re on the suspect list. To prove your innocence, you will need to break into a surveillance van and piece together the mystery. Expect mind-boggling gadgets, espionage, intrigue, and a healthy serve of good old-fashioned code-cracking. Pozible Rewards: Bespoke Street Adventure! That’s how Alex describes the Adventure of the Jade Monkey, a custom street adventure made for her and her partner Elliot by Pop Up Playground’s Robert Reid and Sayraphim Lothian – and with the Bespoke Street Adventure reward in our Fresh Air 2015 Pozible campaign, you could have a unique experience like this of your own! Designing mostly for festivals and open to the public events, Pop Up Playground usually works within certain constraints of size, budget and resources-to-players ratios. But this reward lets us throw a lot of those constraints out the window to make something entirely different: a once-only, unique adventure for a small group! We’ll get in touch with you to figure out a time and place where you want to start, and perhaps go back and forth with a few requests for information, but then it’s down the rabbit hole you go. It’s up to you who you invite, and whether you tell them what they’re in for: a unique adventure experience, just for you, in which you will have to find clues, solve puzzles and complete challenges to reach your destination. You might end up on the run from spies, chasing a monster, searching for a stolen artefact or unlocking a bizarre mystery – but whatever the case, you and up to seven of your friends will be the only ones to ever go on this particular adventure. We’d love the chance to make something like this – and by choosing this reward you’re not just embarking on the adventure of a lifetime, you’re also supporting the growth of the Fresh Air festival. Your support will allow us to bring out international artists, pay our staff and make our games bigger and better, all while keeping the festival free to attend. You can find out more at our Pozible campaign page. Most of the games we run at Pop Up Playground are for the public: they’re fun, they’re silly, they’re designed to reconnect you with the playful side of yourself you were told to put away when you were no longer a child. But you can also play some of our games at work! Games can combine an exercise in imagination with the interpersonal and analytical skills you use every day in the business world: teamwork, communication, problem solving, leadership, confidence, risk management. They won’t magically level you up overnight, but the systems used in games present a new context in which to exercise those skills – plus it’s a lot of fun! 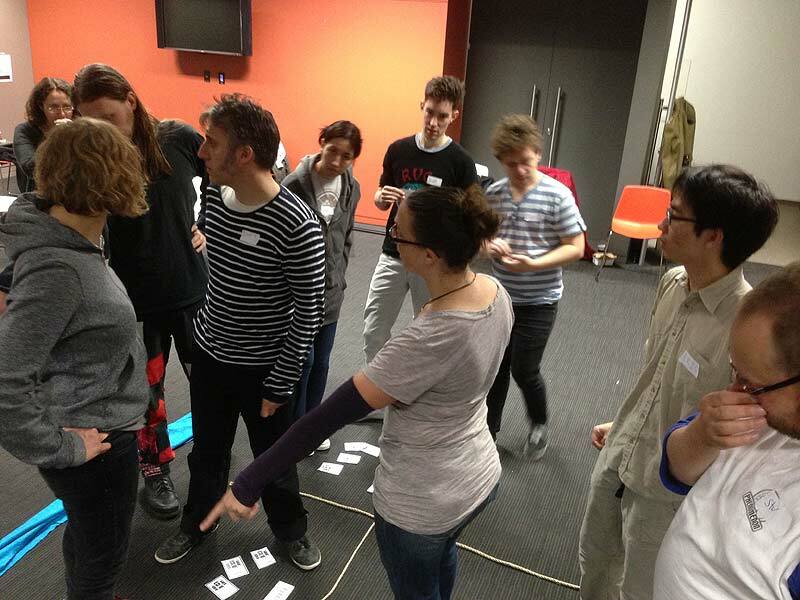 Pop Up Playground has a variety of corporate workshops – and as a special corporate support level in our Pozible campaign, we’re offering the two-hour version at a discounted rate! Our game runners will come to your workplace, warm everyone up with a few smaller games, then put your team through their paces with games tailored to promote team building and business-applicable skills, all while having a good time your staff will be talking about for weeks! And as if that’s not enough, you’ll also be named as a corporate sponsor of the Fresh Air Festival for 2015. While our corporate workshops are available all year round, this special discount rate of $1,500 for the two-hour version is only available as part of our Pozible campaign, so if you’ve thought about doing something different for your staff, get in now! We’ll negotiate a time with you to make it happen. And if you have any questions you want to ask, just get in touch. 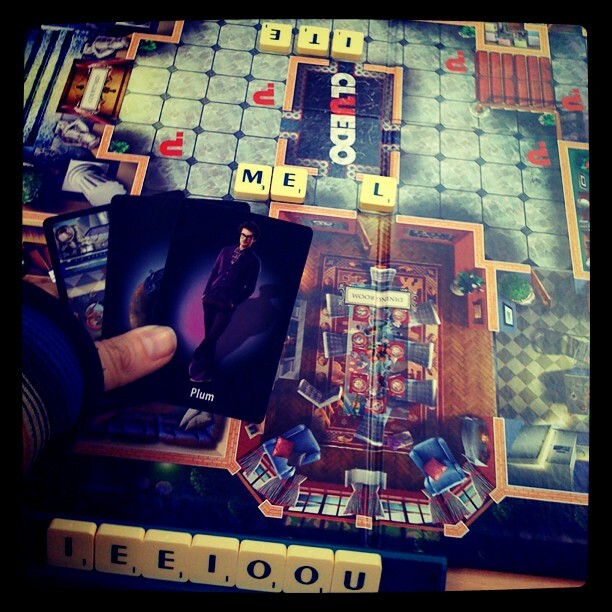 Pozible Rewards: Wanna Play a Game? We love to run our games for people, but outside of festivals it can be hard to organise a time and find people to play them! Likewise, people love to play our games, but the opportunities to play them aren’t as frequent as we’d like. And that’s where the $250 “Wanna Play a Game?” reward in our Pozible campaign comes in! Members of the public playing Gong! at Fresh Air 2014. The Ride – an epic battle between two Viking villages; can you achieve sufficient glory to be taken to Valhalla? Gong! – a street sport where you get to change the rules! Bury Your Treasure – thievery and combat on the high seas – can you steal and hoard the most booty? Pudding Lane – London is burning! Can you work together to put out the fires before all is lost? Wikisneaks – devise a secret code and transmit information without getting caught in this game about unlocking secrets! Spy Catcher – the Agency has been infiltrated at the highest level! Only the junior spies can be trusted to interrogate the spy leaders and expose the double agents before it’s too late! Ben McKenzie, our Games Mechanic, talks about a work commissioned for Fresh Air in 2014: Serious Business’ Spirits Walk. It’s pretty rare at Pop Up Playground that I get to play a game I’ve had almost nothing to do with, but last year that was exactly what I got to do with Spirits Walk, the headline game of the festival – and what a game it was. So: players are invited by the Tattered Prince, head of the court of Melbourne’s spirits and gods, to join in the Spirits Walk, a celebration of the spirit world. But you can’t just rock up to something like that unprepared, you must have a mask – and not just any mask, a mask made of spirit stuff. So the Prince has weakened the walls between our world and his for an hour, and given us instructions on how to find various little gods of Melbourne. If we can satisfy them, they will grant us tokens of the spirit world we can bind into a mask so we can join in the Spirits Walk! What that translated to was one of the greatest experiences of my life. I scurried about the city, following the map in my guide to the spirit world, looking for the gods and enacting the prescribed rituals needed to summon them. I was asked to trade a worthless piece of paper for “something of value” with strangers, to give up a secret of my own to a snappily dressed spirit under a bridge, to dance intimately with a partner under the gaze of the public to music no-one else could hear, to fight invisible monsters to protect ordinary people just trying to cross a bridge, and more. All of these activities were transgressive and touched on things we’re told not to do: wave (cardboard) swords around in public (don’t worry, it was slow and safe), ask people you’ve never met to give you something, ignore the approving or disapproving looks of strangers as you dance in front of them… Each on its own was magical, but to dash about the city seeking out as many of them as possible in a limited time made it exactly the sort of transformative experience you see in stories of urban fantasy and (to borrow Grant’s own term) junk magic. When I say transformative, I don’t just mean of the player, but of the city. One of the great experiences of games like this is that you don’t look at the space in which you play them the same way. Degraves Street isn’t just a collection of cafés for me anymore – it’s where I danced to please the Skipping Girl, a spirit who just wanted me to be free and embrace the music; Hosier Lane isn’t just “that one with the amazing graffiti”, it’s where I gave up my favourite hat to a spirit without knowing when or how exactly I would get it back. These are magical stories and experiences that are layered on my city, crafted with great care and style by Grant and Mary and executed by the amazing cast in their incredible masks. Spirits Walk is another example of a game that just isn’t possible without the infrastructure of a festival. Robert Reid and the Fresh Air team took Grant and Mary’s design and hired actors, commissioned masks and costumes and props, scouted locations and scheduled rehearsals. I often joke about one of our early works, The Curse, that it requires more actors than players, but some of the greatest experiences need this kind of scaffolding. The players still make the stories themselves, but they are guided by creatures of our making, played by actors and mediated through craft. There’s nothing quite like it, and it’s for pieces like this that we make Fresh Air. All the more amazing, then, that we did it on the shoestring budget of last year – and that it was free to experience! I really hope Grant and Mary mount it again, because every city deserves a little junk magic. To keep making things like this, especially in collaboration with international designers, we need to increase the Fresh Air budget – and that’s where our Pozible campaign comes in. Please check it out and pledge if you can – there are some amazing rewards on offer! But it’s just as vital to our success for you to help spread the word. A collaboration between Pop Up Playground’s Sayraphim Lothian and Serious Business’ Grant Howitt, LMBDO is honestly one of the best games I’ve had the pleasure of running or playing. 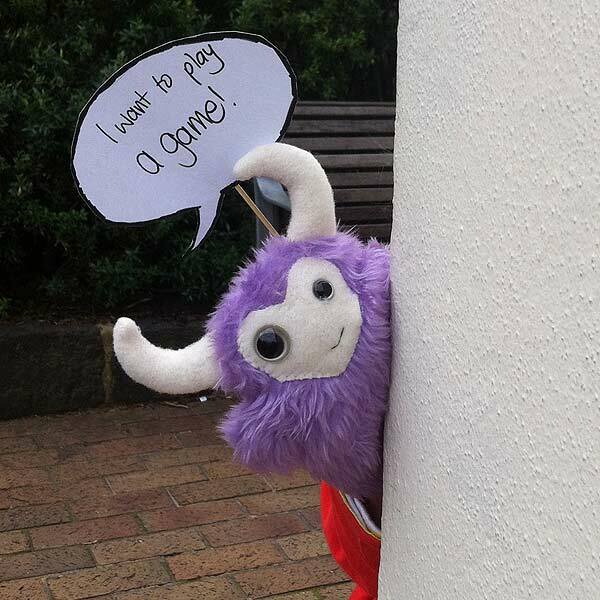 It packs a huge amount of adventure into a simple setup: pairs of players tie on monster tails and run all over Federation Square taking photos of their cute little monster friends, each of whom wants to go on as many adventures as possible in the time limit! What kind of adventures? Well, they tell you via speech balloons, but their desires are kind of vague; it’s up to you to figure it out! Play is often a great way to get people smiling and having fun, but LMBDO lights up faces and hearts in people of every age like no other game I’ve seen. That’s due in no small part to the amazing tails; one you strap one on it instantly frees you of any inhibitions you might have about being a bit silly in public! Plus the little monsters themselves are so damn cute. (Every time we’ve run it we’ve had multiple people ask if they can buy one of their own.) All of the props were created for Pop Up Playground by incredibly talented Melbourne craft artist Jellibat, some of whose work you can find on Etsy, and they are a huge part of the game’s appeal. LMBDO is a great example of a little game which feels like a big experience. It’s also the kind of thing it’s not practical to make and sell for people to run themselves, thanks to the importance and number of the props, and so it can only exist thanks to the support we receive here at Pop Up Playground. We want to make and run more games like it, and fill Fresh Air to bursting point with awesome situations – and you can help! We’re raising money to help make Fresh Air 2015 bigger and better than ever, and we’ll be using that money not only to bring out international designers, but to make and run more games like Little Monsters’ Big Day Out. Check out our Pozible campaign and help us out by pledging some money for one of our cool rewards, or even just spreading the word! Fresh Air international games announcement 1! Stag Hunt from nikkipugh on Vimeo. The Soho Stag Hunt has been played in a number of cities in different versions, including a creepier version called Black Stag in Pittsburgh; we’re excited to work on a version that will suit the particular needs of Fresh Air! Fresh Air 15 and our very first crowdfunding campaign! Fresh Air 2015 is crowdfunding on Pozible! Seek out strangely familiar life and go where nobody really ought to go in this game that’s half improv, half scavenger hunt and half choose-your-own-adventure. Don the uniform, pick up your iTricorder and become your favourite character, and join the rest of the crew on a mission to the year 2014.